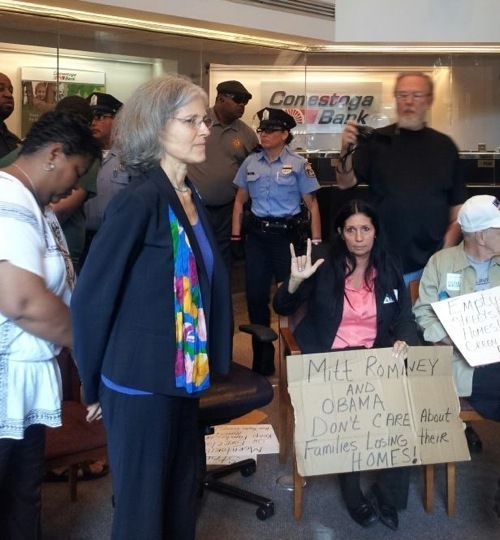 Green Party presidential candidate Jill Stein [also a long-time Green-Rainbow Party member] and her vice presidential running mate Cheri Honkala were arrested today [August 1, 2012] during a protest at the offices of mortgage company Fannie Mae on Banker's Row in Philadelphia. Among those arrested along with Dr. Stein and Ms. Honkala were labor lawyer James Moran and Sister Margaret McKenna of the Medical Mission Sisters. An attorney who supports civil disobedience cases is providing legal assistance. All of those arrested are expected to come before a judge early on Thursday morning. At that time bail will either be set or they will be released on their own recognizance. The protest was originally called for by the Poor People's Economic Human Rights Campaign to demand that the giant mortgage company halt foreclosure proceedings against two Philadelphia residents in danger of losing their homes. Stein joined the protest after Cheri Honkala joined her as Stein's vice presidential running mate. Honkala, a former homeless single mother, has been confronting banks and mortgage companies for decades demanding that they adopt policies that will, "keep families in their homes." At 1pm today about 50 protestors gathered outside of Fannie Mae's Philadelphia headquarters. They heard from Miss Fran and Rhonda Lancaster, the heads of two families evicted by Fannie Mae in its refusal to negotiate an alternative to foreclosure. Fannie Mae executive Zach Oppenheimer had previously promised in writing to meet with the two women in order to discuss other options. Yet no followup meeting ever took place, and so protestors today entered the Fannie Mae building and vowed to stay until Mr. Oppenheimer's word was honored. At about 2:30pm, an hour after entering the building and beginning a sitdown protest, lower level Fannie Mae officials agreed to meet with Miss Fran and Ms. Lancaster. These meetings proved inconclusive, ending only with promises of more meetings. With Philadelphia police on hand with six paddy wagons and plainclothesman, a smaller subset of protestors stayed inside the building and risked arrest. Five were arrested, including Dr. Stein and Ms. Honkala. In explaining why she joined the protest, Stein said that almost half of Americans now live in poverty or near poverty, eight million families face eviction from their homes due to foreclosures, and over a third of mortgage holders are "underwater" - meaning that they owe more to the lenders than their properties are worth on the market. Said Stein, "The developers and financiers made trillions of dollars through the housing bubble and the imposition of crushing debt on homeowners. And when homeowners could no longer pay them what they demanded, they went to government and got trillions of dollars of bailouts. Every effort of the Obama Administration has been to prop this system up and keep it going at taxpayer expense. It's time for this game to end. It's time for the laws be written to protect the victims and not the perpetrators. It's time for a new deal for America, and a Green New Deal is what we will deliver on taking office. " "The laws and the budgets and the procedures are designed to protect the lenders and to extract as much money as possible from the victims," Honkala explained. "This isn't the way it would be if we really had a government of the people, by the people, and for the people. The first goal of government should be to keep families in their homes, and to provide restitution for the deception and fraud that has robbed millions of Americans of financial security." Stein laid out a number of steps that will be part of a new deal for homeowners when and where the Green Party wins power. First, as President, Dr. Stein would issue an executive order establishing a moratorium on foreclosures of occupied dwellings. Second, municipalities governed by Greens will get homeowners out of underwater mortgages by seizing mortgages through eminent domain and letting non-profit community development organizations - not Wall Street banks - reissue the mortgages. Noting that the Obama administration has only released 10% of the aid that Congress had promised to homeowners, Stein asserted that "There is much more interest in Washington in protecting the profits of banks than in getting this aid out to the families whose lives are falling apart. President Obama held a big press conference to announce a program that would supposedly help 1.5 million homeowners and so far it has actually helped only 1 per cent of that number. Real help goes to the CEOs who play golf with the President and the people get lip service. This will change only if the people stand up and say we're not going to put up with it anymore." My family has lived in this home in Germantown for over 35 years. When my mother got ill and could not afford her health care, a reverse mortgage idea was presented to me. They made it look like it was a great thing. It was going to take care of my mother, and when my mother passed away it would be just fine. The nightmare started after my mom died. I notified the bank she had passed away, and two days later I was getting ready for her funeral. Relatives and friends were coming in from all over the country. The bank told me to stop everything and let them come in and do an appraisal. The bank refused to accept me as the executor of her estate, although the proper papers had been filed at City Hall. From that point on it was a complete nightmare. I could get through to no one and no one could help me. They denied me my legal US rights as heir to my mother’s property. Really a nice post. Thanks.